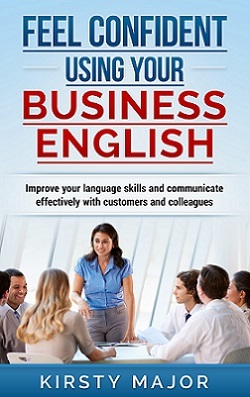 Presenting information to others in your native language can be a daunting task at times. Presenting in an other language can make you feel even more nervous. However, with these simple steps and with good preparation, you can make the task easier for yourself and you will hopefully feel more confident about the end result. It might be tempting to write a script or at least the key points in your native language but in doing this, you’re giving yourself a translation exercise as well. This could result in a lot of wasted time because you tried to translate the text phrase by phrase and the end result might not sound as good because you tried to stick too closely to the original text. If you’re going to present information in English, it’s better to do your planning in English too. You may feel a bit frustrated because you could say much more in your native language, but it’s better to have simpler sentences about which you feel confident than complex ones that catch you out when you try to deliver them. You can’t plan for every question that someone might ask you, but think of the kinds of things that your audience will want to know and make sure you know the basic vocabulary that you would need to answer these questions. If it helps, take a short checklist with you but don’t spend too much time looking at this while you’re presenting or taking questions. If you don’t know a word, try to think of another way of getting the idea across. If you are really stuck, you could tell the person who asked the question that you’ll get back to them with the information later. Alternatively, if you feel it’s appropriate, you could ask someone for help with the word … but then move on and don’t give it any more importance. Many of us don’t like to listen to our own voices and some people feel more self-conscious when they hear themselves speaking another language. I sometimes make audio recordings of new vocabulary for my beginner students and I still find it strange when I hear myself speaking German on the recordings, even though I speak German all the time in other situations. You may feel more confident if you practise listening to yourself speaking English. You don’t have to make a recording, but say the words aloud. Talk about the subject material or your slides when nobody else is listening. If you want a live audience, pets make wonderful, non-judgmental listeners. My dog often listened to me practising presentations in German or basic Turkish. She sometimes put her head on her paws and fell asleep but she never interrupted or laughed and practising in this way helped me to relax. If presenting isn’t your favourite thing, it’s really tempting to try to gallop through your presentation so that it will be over sooner. However this only puts you under more stress and makes it harder for your audience to follow what you’re saying. This is also the case when you are speaking another language. Showing that you can speak quickly is not a way to show that you can speak well. Neither does it prove that you know a lot about your subject area. If English isn’t your first language, it’s possible that it will be a second or third language for other participants too and slowing down a bit may help them to understand your message. It’s normal to lose your train of thought, mispronounce a word, forget a word, hesitate or do any number of other things that weren’t in your plan for a perfect presentation. These things are normal and they could happen to anyone. The key to dealing with any of these things is to deal with the problem and move on. Don’t let one small mistake knock your confidence and ruin the rest of what you wanted to say. You could start the sentence again, take a few seconds to collect your thoughts, have a sip of water whilst collecting your thoughts and then continue to deliver the rest of your message. How easy you find presenting information in english will depend to some extent on how easy you find presenting information in your own language. However if you take the steps outlined above, you can go into the presentation feeling more confident because you know you have prepared well. With time it should get easier. It would be great to hear your experiences. Let me know if you try any of these tips and whether they made a difference to how you felt before and after the meeting. If you’re preparing a presentation as part of a job interview I have a specific article on that. I also have an article on planning to take English questions after a presentation.